and the potential consequence of not exhibiting it in the second half! It's been apparent for almost 35 years now that tail-flagging adult squirrels are safer from rattlesnakes than squirrels that don't perform this behavior, but why? tail-flagging does not appear to be a form of harassment, like mobbing in birds & other animals, because the squirrels never attack rattlesnakes if the snakes are free-ranging (although they will if the snakes are caged, as they were in early experiments) and eventually leave the snakes alone after tail-flagging at them for a while. Additionally, the tail-flag display is frequently given in the absence of a rattlesnake, as if to probe for potential predators nearby. So how is tail-flagging helpful? By videotaping countless hours of snake-squirrel interactions using stationary cameras - fortunately, rattlesnakes are fairly stationary themselves - Clark's group thinks they have the answer. First, the squirrels are probably advertising their perception of the snakes, both to the snakes themselves and to each other. This is likely because tail-flagging by one squirrel increases the vigilance of other squirrels in the area. Furthermore, rattlesnakes that have been tail-flagged are actually more likely to abandon their ambush sites. Both these things only happen, however, when the tail-flagging squirrel is an adult. Similarly, we respond more seriously to cries of a fire by an adult than by a child. Juvenile squirrels also tail-flag, but presumably they are just practicing, so adults apparently do not take them seriously. Second, the adult squirrels are probably also advertising their vigilance to the snakes. 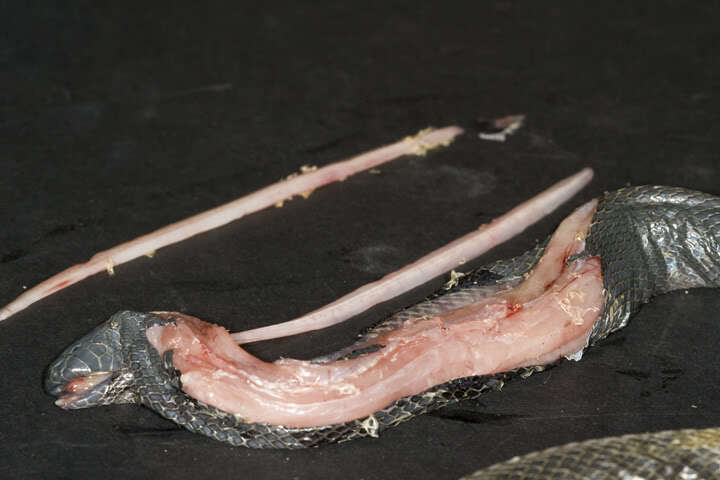 This is likely for two reasons: 1) the snakes are less likely to strike an adult tail-flagging squirrel than a non-tail-flagging one, and 2) if they do, squirrels that tail-flagged are more likely to successfully dodge the rattlesnake's strike. That's right - these ground squirrels can actually evade the snake's strikes. Don't believe it? I hardly can either, but wow, that squirrel pulled a 180 and totally avoided what should have been a lethal strike. 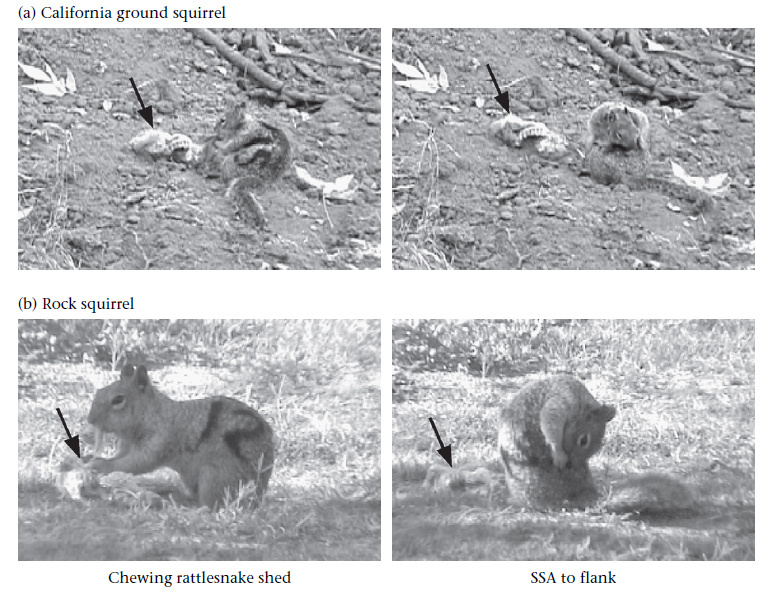 Although the squirrel in that video wasn't tail-flagging, Clark's group has shown that within about one foot of a rattlesnake, tail-flagging squirrels are more likely to dodge strikes successfully. As a result, rattlesnakes are less likely to strike at a tail-flagging squirrel - not because the energy cost is too high, but because a strike will surely cause the squirrel to run off, while waiting might result in the squirrel making a mistake by getting too close. After all, once a snake has been tail-flagged, it might as well move ambush sites, because the local squirrels are now aware of its presence. In addition to employing highly effective perception and vigilance advertisement behaviors, those darn squirrels have also evolved to anoint their fur with rattlesnake scent! They get this odor from chewing up shed rattlesnake skins. Barbara Clucas showed that the snake scent application did not deter other squirrels or help reduce ectoparasites, bolstering the case that it is a form of olfactory camouflage that serves to reduce squirrel detectability to snake predators or to repel other rattlesnakes motivated to avoid hunting in the same area as a conspecific. If you want to see more videos and stay current on the Clark lab's research, subscribe to their Youtube channel or to Strike, Rattle, & Roll, a rattlesnake behavior blog published by Clark lab PhD student Bree Putman. Thanks to Rulon Clark for his helpful review of this article. 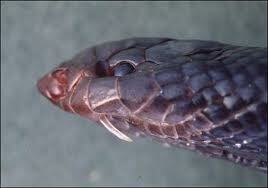 I have just returned from attending the Seventh World Congress of Herpetology (WCH7) in Vancouver, Canada. This meeting is held once every four years, always in the same year as the Summer Olympics, from which it differs in several important ways. Although many celebrities attend each, the WCH primarily consists of scientific, rather than physical, displays of prowess. Until a gold medal is given in lizard noosing, herpetologists will continue to present their research at the WCH, as I had the opportunity to do this year. 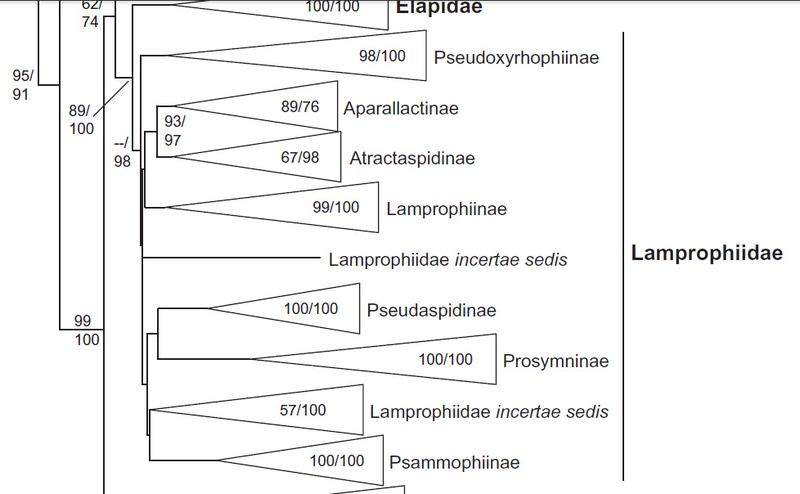 Because of the large number of excellent talks highlighting new research in snake biology, I have decided that the next several articles on LISBSOL will constitute a series inspired by the work of the many herpetologists whom I saw presenting at WCH7. If you want to learn more about the WCH, check out the June 2012 issue of Herpetological Review, or follow the Twitter hashtag #wch2012, with which I will tag all posts in this series (disappointing though it is that herpetologists should be forced to 'tweet' their research rather than 'hiss' or 'croak' it [I couldn't figure out how to spell the sound that alligators make]). One tradition at WCH meetings is to open each day with a plenary talk, which is an hour-long presentation by a distinguished herpetologist. Of the several plenaries at WCH7, the one that impressed me the most was given on the first day by Karen Warkentin, a herpetologist at Boston University who studies environmentally-cued hatching of amphibian eggs. 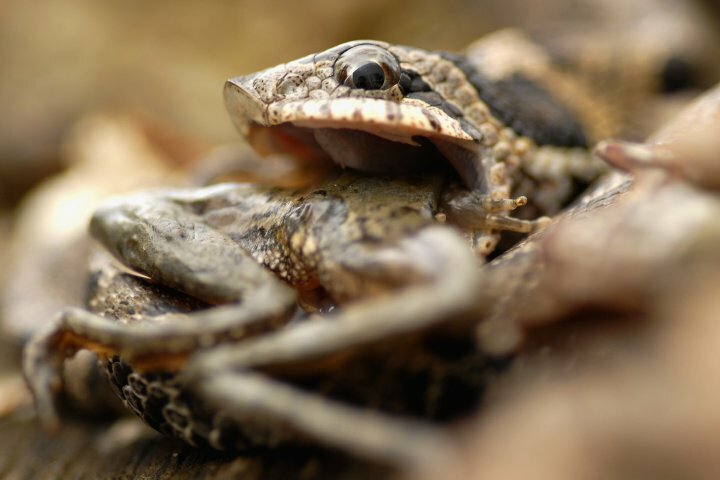 One of the foundations of her research is that the timing of hatching, a critical life-stage transition in the life of an amphibian (or reptile), should be flexible in order to maximize the likelihood of survival of the young animals. That is, if the egg is safe from predators and pathogens, hatching should be delayed as long as possible (typically until the embryo is as large as it can get without leaving the egg). However, if the egg is in danger, hatching should speed up, as long as the embryo is capable of living outside of the egg. This phenomenon is observed in a variety of reptiles and amphibians, including the Agalychnis (red-eyed) treefrogs that Dr. Warkentin studies. These frogs lay their eggs on leaves overhanging pools in the Neotropical rain forests, so that when they hatch the tadpoles can drop into the water. Look at those little guys hatch! 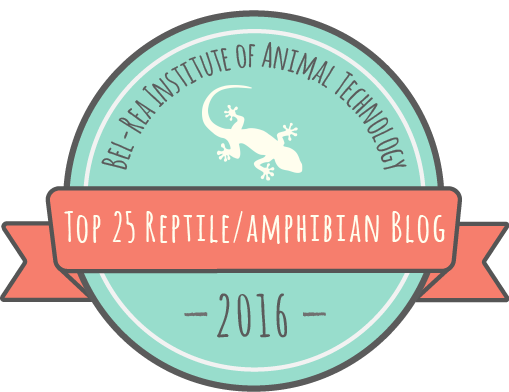 You can see other videos at Dr. Warkentin's website, where you can compare the feeding behavior of Leptophis with that of the Cat-eyed Snake (Leptodeira). Embryos in the last third of their development escape from snake attacks with about an 80% success rate by hatching up to 30% early, which is really remarkable. Furthermore, they can distinguish snake attacks from other sources of vibration, so that they don't hatch every time it rains. To do this, they respond to several non-redundant vibrational cues, including frequency, duration, and their interaction. These cues propagate throughout the jelly matrix of the eggs, so that eggs that have not yet been touched by the snake can escape. In two species of Agalychnis that have reduced jelly, escape success is much lower, because the signals do not propagate as well. 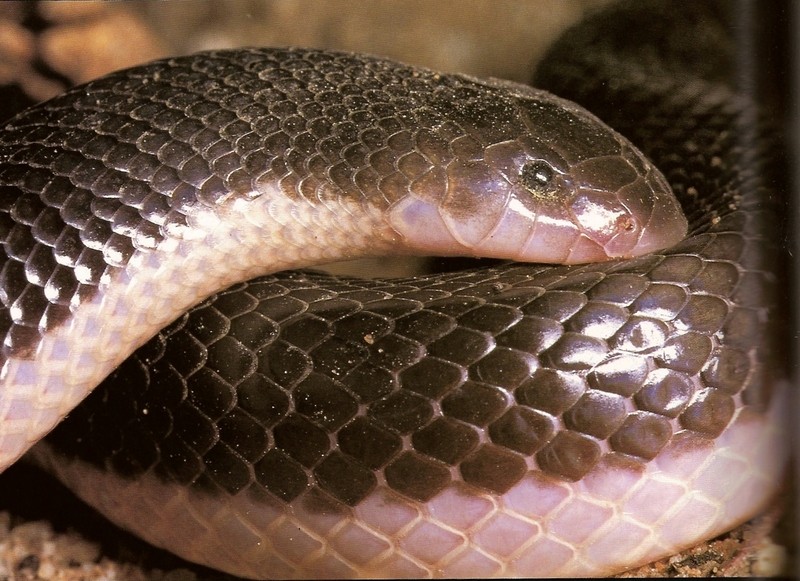 According to Dr. Warkentin, the snakes do not appear to prefer younger eggs (which would be incapable of hatching early) or to forage preferentially in the rain (when their vibrations might be masked by raindrops). 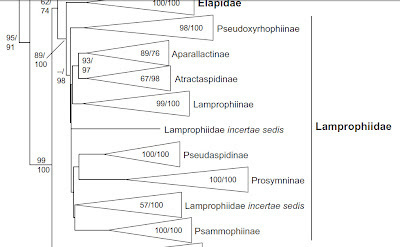 Along with Leptophis and Leptodeira, two other snake genera, Sibon and Dipsas, possess morphological and behavioral adaptations for feeding on frog eggs and other prey items that are essentially 'goo'. Not unlike the southeast Asian pareatids I've covered before, these Neotropical snakes have numerous, long, slender teeth on the dentary (lower jaw), and they have many skeletal and muscular modifications that allow for jaw flexibility beyond even that normally seen in snakes. Extinction of many frogs due to chytrid fungus in Central America has caused dietary shifts and changes in abundance of these snakes. 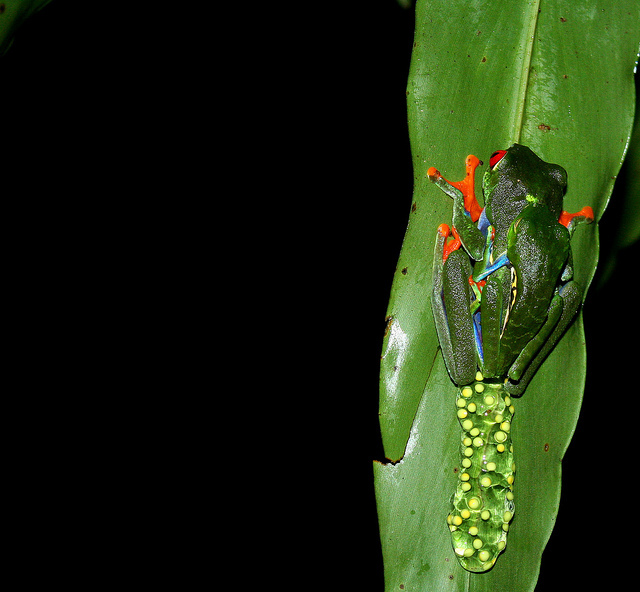 Environmentally-cued hatching in response to vibrations also occurs in the eggs of other treefrogs, centrolenid glass frogs, and African reed frogs. It can also occur in response to other environmental dangers, such as flooding (in salamander and some turtle eggs) and disease (in frog eggs and also in painted turtle hatchlings, which often overwinter in the nest but are more likely to emerge early when infected with sarcophagid fly larvae). This last example comes from the thesis work of Julia Riley at Laurentian University, who presented preliminary results at the WCH. She also found that turtles hatching in nests that were on steeper slopes were more likely to emerge early, possibly to avoid collapse of the nest over the winter. Whether research will one day show that snake eggs also possess environmentally-cued hatching plasticity is an open question, but I suggest that a good system to start looking would be the Nicrophorus beetle hosts. Maybe we'll be hearing about that at WCH8 in Hangzhou, China! Thanks to Otto Monge, Brad Wilson, and the Warkentin lab website for providing photos and videos. Also now available in Spanish! Ahora también disponible en español! 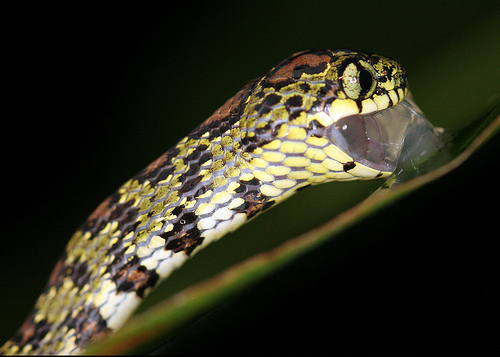 Check out the piece on toxin-sequestering snakes I was invited to write for the Scientific American Guest Blog! !